Spend 8 glorious Grecian nights on these three islands surrounded by cobalt blue waters and dramatic rocky coastlines. We’ll fly you away from the stresses of life and you can flop down by the pool and relax because we’ve handpicked some of the most romantic island spots in Greece. Once you’ve worked up some energy to leave your peaceful hotel, we’ve found interesting sites, towns and naturally, endless beaches for you to amble along. Land on Santorini, where you’ll head to the town of Oia and settle into your luxurious suite at the Adronis for three splendid nights. With traditional Aegean white-washed architecture, these suites are truly serene. Hideaway here with your loved one and bathe in your private cave pool, overlooking the island’s crater bay. Indulge in some freshly caught seafood for lunch followed by an afternoon in the spa. You’ll be feeling fully revitalized and ready to climb to the pinnacle of the town where a ruined castle rests and you can enjoy fantastic views as the sunsets over your Arcadia. In the following days explore the rest of the old town’s cobbled streets and blue domed churches or take a short drive to the 5000-year-old Minoan site of Akrotiri; a kind of Greek-Pompeii where you can walk along the streets and into the painted houses of the ancient site. There are plenty of little beaches to discover as well, some of which can only be reached by boat, or add some glamor and take the hotel’s helicopter to a cove of your choice. For the next part of your trip, we’ve organized for you to sail and float your way over to the black cliffs and white beaches on the eastern end of Folegandros. You’ll rest your head here for two nights in the boutique Anemi hotel. Blending seamlessly with the landscape the hotel is surrounded by perfumed gardens. Lie by the pool with a cocktail and admire the stunning sea views. Taking advantage of fresh, local ingredients you’ll even be able to taste the sunshine in the meals prepared at the delightful hotel restaurant. The closest beach to your hotel is just 400m away, with sugar-white sands and sapphire water. Go for a paddle and then stroll up into the harbor village of Karavastasi and sit with locals in one of the few taverns. Spend a day exploring the rest of the island by car: beautiful Hora and medieval Kastro. You won’t want to leave this paradise isle and will be wishing mythical Calypso was there to keep you hostage. For a final stop on your island excursion, you’ll then catch the boat to the smaller island of Sifnos, where you’ll spend your last three nights at our best-kept secret; Elies Resort. Here you can experience traditional Greek Island life and discover Sifnos’ gastronomic excellence with a few cooking lessons, which incorporate an authentic mix of the island’s local produce. Once fed and watered we’ll let you in on our favorite beaches to explore or get lost in rustic Sifnos by walking the area’s endless country trails and ancient villages atop its beautiful yellow and white, coastal hillside. 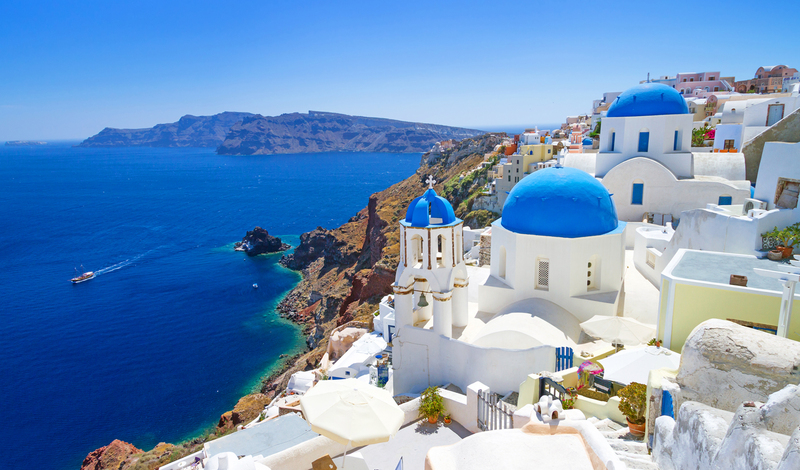 The ferry ride back to Santorini for your flight will help you transition back to reality, departing completely besotted with these island sanctuaries.